Articles about "LG GW 305 Harga dan Spesifikasi LG GW305" in this website is free. Read our reviews for "LG GW 305 Harga dan Spesifikasi LG GW305", cellphone price, handphone specs, features and find more latest Cellphone specs and reviews. 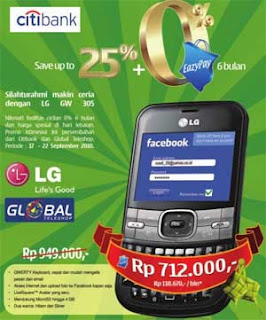 LG GW 305 got special price at Global Teleshop, especially for Citibank Card holder. About the special discount price, LG GW 305 got price for only 712,000 Rupiah (from normal price 949,000 Rupiah) and it save up to 25% and 0% installment.